As a versatile companion to signature hollow core slipforming machinery, an extruder leads the Spancrete portfolio expansion. Spancrete equips the new multi-function machine and upgraded slipformer with advanced automation and remote diagnostic capabilities—all geared to customers seeking labor-saving solutions and safeguards against protracted plant downtime. Rounding out the manufacturer’s portfolio are new clamps for plant or site use, plus saws and other components for plank and wall panels. Compared to legacy offerings, anchored by signature slipform hollow core machines, the new equipment provides more technology-based precast production solutions. Each is scalable to a company’s individual plant needs, Spancrete officials note, be it one component or device to supplement an existing system; a replacement machine that will adapt to existing casting beds; or, a multiple product configuration. The manufacturer has also announced availability of replacement parts that fit most hollow core extruder brands. “Everywhere in the world, precast plants are adapting to the changing needs of customers, confines of the marketplace and available resources. 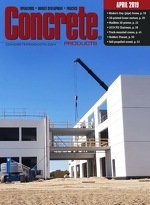 In expanding our equipment offerings by focusing on automation, we are aligned to meet precast production system needs today and in the future,” says Spancrete President and Chief Operating Officer Alan Antoniewicz, who oversaw new machine and component development with Vice President and Managing Director, Machinery John Schnell, formerly vice president of Precast Operations.